Some months back, I wrote about MTN in Swaziland. While MTN offers post-paid, or contract, cell phone plans, many people around the kingdom use MTN’s pay-as-you-go service. This system works by purchasing airtime. While airtime can be purchased from MTN stores and authorized retailer shops, it’s also available at most grocery stores and various other shops. One of the most readily available places to get airtime is from a street vendor. Some street vendors have a big yellow umbrella (like the one in the picture above). All vendors have a yellow MTN vest that identifies them as MTN vendors. 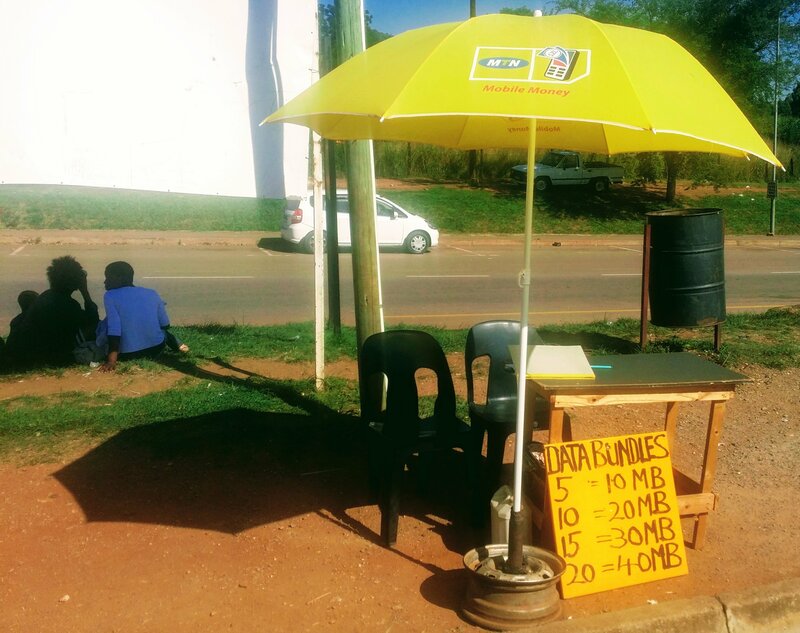 With an MTN street vendor, you can buy a SIM card, airtime, or data bundles among other things. MTN street vendors also work with MTN’s Mobile Money service. Mobile Money is another world. It’s a wallet connected to your cell phone number. It can be used to send and receive money, pay bills, and buy airtime. It’s similar in many ways to PayPal or Venmo. The MTN street vendor is often a one stop shop for handling many matters.